A thought leader is someone recognized for knowledge in an area, a go-to person. 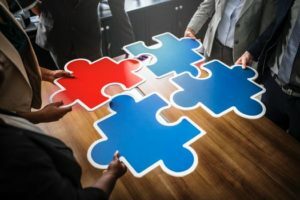 Their knowledge allows thought leaders to synthesize complex information and package it so that others see the connections – put pieces of the puzzle together in ways that enable them to take practical actions that move ideas and knowledge forward. Thought leaders benefit as their reputation grows and their range of influence widens over time. Thought leadership is a form of art, based on our unique perspectives — a form of “leadership” that has nothing to do with years in grade or positional title. About what issues do your colleagues ask questions of you? In what particular population of patients or issues are you most skilled? In what complex areas have you built proficiencies through research, study, practice, persistence, and feedback? Are you currently sharing your expertise with others? If not, why not? Are you participating in communities built around your area of expertise? As an active voice or simply lurking? So, you might be a local thought leader if: you are the local go-to person on an area, you influence the knowledge and practice of those around you, and you demonstrate expertise in contributing to your patients’ outcomes. We need you to prepare to contribute further to the conversation, to enable the rest of us to better define problems and phenomena and develop better approaches. Now, it’s time to deepen your expertise and broaden your reputation. Begin to disseminate your expertise. Write a blog, contribute to journal articles, volunteer to serve on a local board or to speak before a group of other clinicians or patients. Find venues for networking and share your opinions and knowledge with others. Invite others to reach out directly for advice or confirmation. Remain relevant and up-to-date in your topical area and to share your perspective. All of these forms of creation will contribute to your growing reputation and expanding understanding of your topic. So, you might be a future thought leader if you are willing to act on your expertise to benefit others around you, growing your influence outwards. Clarke (2015) offers one approach to developing a reputation of thought leadership that guides us through identifying the topic on which we have strong interest, to taking actions to develop ability to collaborate with others, describing knowledge in innovative and practical ways, and build an audience and, ultimately, even a community around it. This is one approach that you may find helpful. For more ideas, search the online business literature from sources such as Forbes, Entrepreneur, and Harvard Business Review. Start at Google and LinkedIn, to begin exploring this topic today!